Cards: Donruss Rookies & Stars 2009, Donruss Rookies & Stars 2010. 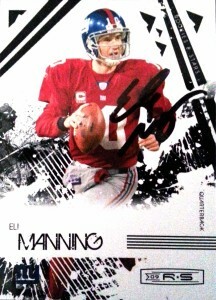 Less than a week after wrapping up the crown jewel of in person autographs for 2015, lo and behold, the arrival of Eli Manning TTM. I had seen a lot of recent successes for the enigmatic signer and decided to take a stab. Eli Manning actually first garnered my attention when he was at Ole Miss. I was working on Tecmo Fiesta Bowl for a front end- that the programmer later dropped off the face of the Earth on, and input Manning’s out of sight abilities. (He was basically Dan Marino from Tecmo Bowl playing with a bunch of scrubs.) I knew he was going to be a good player in the pros. It also helped that he’s the son of former quarterback Archie Manning, and the younger brother of Peyton Manning. Originally the #1 overall choice of the San Diego Chargers in 2004, Manning refused to play for the team due to organizational differences. It was rumored that the elder Archie did not want his son to play for a perennial loser or for defensive mided coach Marty Schottenheimer– but in reality, the Chargers had orchestrated a trade with the Giants well before the draft, if New York could wrangle in QB Philip Rivers and toss in a few picks to quickly rebuild the moribund Charger franchise. While the Mannings took a lot of flak from fans and the press for their percieved behavior, it was fait accompli between the Giants and Chargers. As Manning got off to a rocky start his rookie season, with 6 TDs to 9 picks, and 48.9 completion percentage, San Diego appeared to have made the better deal and Giants fans were murmuring, but once Manning established himself as the starter, he became one of the league’s ironmen under center starting 167 straight games, through the 2014 season. In 9 of his next 10 seasons, he attempted more than 500 passes. Manning came of age in 2007, leading the Giants to a Super Bowl win (XLII) over the previously undefeated New England Patriots, 17-14. He’d be named MVP after going 19/34 for 255 yards, with 2 TDs and a pick. The season ending victory was a bittersweet culmination of sorts for the Giants and Manning. He had been maligned in the media, by fans, management, and even by former teammate Tiki Barber. In 2011, the Giants repeated again as Super Bowl Champions over the Patriots, this time 21-17. Eli took home his second MVP trophy after going 30/40 for 296 yards and a TD. Although his numbers took a precipitous slide in 2013 as he led the league for the 3rd time in his career in interceptions, Eli’s numbers recovered nicely to form in 2014. 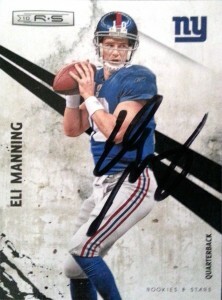 Manning holds many Giants’, NFL, and postseason records. He is considered one of the most clutch quarterbacks in the league (NFL record 15 4th quarter TDs and 8 game winning drives in a season in 2011).